Well it's Oscar night and I'm all alone. Glogirly flew off into the big blue sky this morning. Some silly busy-ness trip. I swear whenever she gets "busy" I get left behind. The worst of it is that now I have no one to watch the Oscars with. Gloman is taking care of me until my girl is back, but he just doesn't appreciate the thrill of the red carpet like I do. 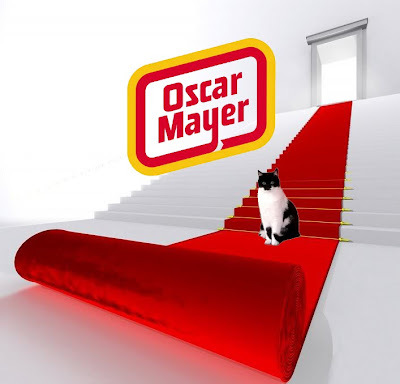 The only Oscar he gets excited about is Mayer. Glogirly only took one suitcase with her so I don't think she'll be gone long. Hopefully when she's back we can dish about the good, the bad and the ugly. 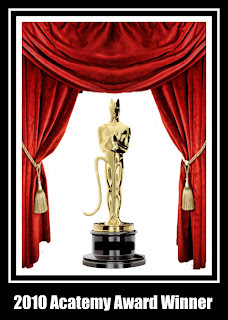 for hosting this week's Acatemy Awards! Mom's been watching the Oscars all night long. They just don't do anything for me, though. I've been snoozing. Our mum doesn't even bother to watch!?! Can you believe?? My mom is watching and I hafta keep bugging her to do my post for tomorrow! I'm gonna be premiering my new live action film! Our Mom doesn't watch the Oscars either ~ cann yoo beleeve it???? But she has agreed to help us post our entry on Monday! Katie, we're sorry your girl went off and left you all alone! Rotten. Just rotten. Mom watched for a while but went to bed before the end. Poor Katie. Can't you stow away in Glogirly's suitcase next time?? But we don't get to watch the Oscars either. . . .
That's just terrible. No cat should be alone on Oscar Night. Listen Katie, when it come to the Red Carpet, you're the first one that comes to mind! Sorry you had to watch the Oscars all alone, Katie. I watched some of it, den had to take a nap. 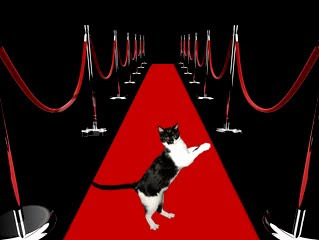 I love your red carpet picture. We slept through most of the Oscars! Hope GG returns soon, with some treats for you, Katie! oh so sorry for this news, alone in such an important night! I hope Glogirly returns soon! While this time, enjoy a great nap okay! I'm here thinking of you! We didn't watch the Oscars here--mama went shoe shopping then we all napped! Awww poor Katie. Its sad to be lonely with no one to share with. The Oscars were good though! I hope your girl comes home soon. Oh Nose! You had to watch the Oscars alone?!? Our mom doesn't really watch them all that much. She's too busy taking everything under the sun on Nat Geo! She's a total dork! Well, it could have been worse, Katie -- at least you had Gloman there, and from what I hear, you really do like the man quite a bit. You sure put out a great red carpet! Mom watched the whole show, and I slept peacefully on her lap. IT was great! How disappointing for you to have to miss the Oscars. Maybe you can watch a repeat when Glogirly gets back. You should have come over here Katie! Darn it, we could have recapped on the phone. i just love all your pictures, they've got me meowing out loud! do not worry, i am verreh sure your mommeh will be back soon. they can't stay away from us you know. It's a pleasure to make your acquaintance. 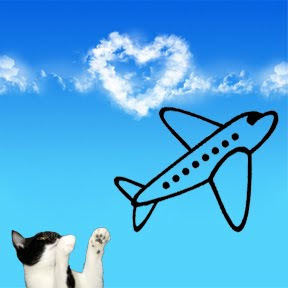 It would appear as though our humans even go on vacation about the same time! Don't let the diet get you down! Do you have any males around? I've always found them to be more easily persuaded into giving me treats. We're sorry your girl left you alone again. We wish there was a little more Mayer in the Oscars, then maybe Gloman would watch it with you.